I posted about this on the TWF Facebook page a little while ago. I realize that we're all not Facebook users so I thought I should share it here as well. A member of our site, noac, forwarded me the URL to an incredibly documented story about the restoration of a 1988 Mustang LX 5.0 hatchback/t-top car. When I posted the link on Facebook I hadn't done more than scan the site. Well, now I've read it from start to finish and it is an impressive story. It is impressive in many ways. One is the story of the ownership of the car. I won't spoil it but many of us can relate to it. Another way is in the level of craftmanship of the restoration. We can all find inspiration in Keith's attention to detail. A third way is the quality of the writing. It's well though out and equally well put together. And the last way is foresight in acquiing NOS parts that he knew he would need. So, go ahead and read it. It will take several hours to absorb it properly. Do yourself a favor and don't read it like you read most blogs (starting with the first page). So what I did and read it in chronological order. Start with the last post of on the last page and let it unfold in the way that Keith experienced it. And note that I would have posted this even without a link to "feature" cars. But, there is. 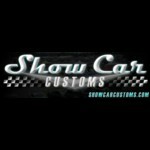 The picture of the car that is included here is from the 2014 Woodward Dream Cruise. 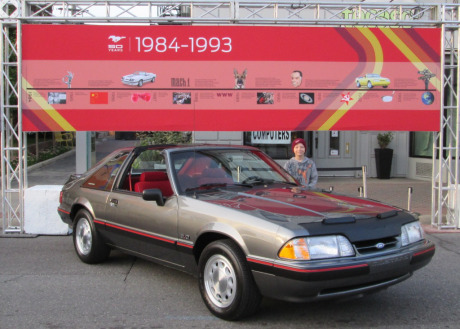 If you look at banner representing the 1984-1993 part of the Mustang history you can see a yellow feature car in the timeline.